Giveaway is closed. Winners announced here. I wanted my July/August 2014 Giveaway to include something handmade that I love making. Some of you probably know I love to make brooches and that's the something handmade I'm including in the prizes this round. 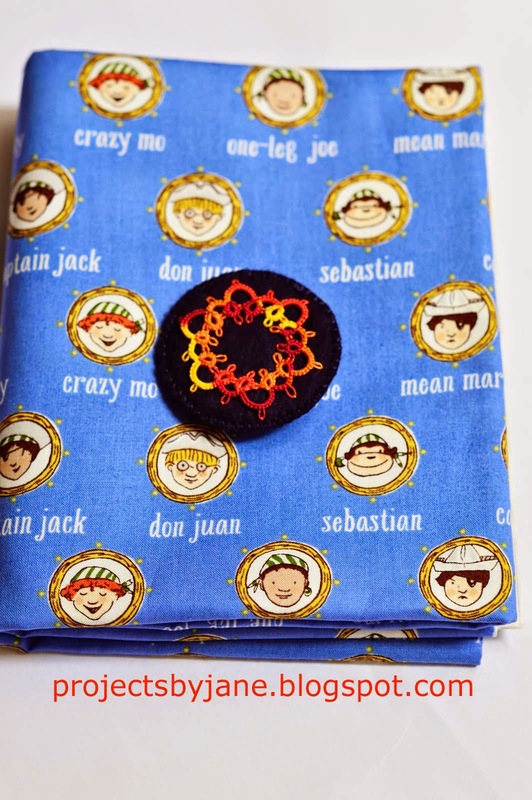 1) 1m of a light blue pirate theme fabric + a flower felt brooch - we'll call it flower-flower. 2) 1m of a dark blue pirate theme fabric + a tatted lace brooch - we'll call it tatted lace. 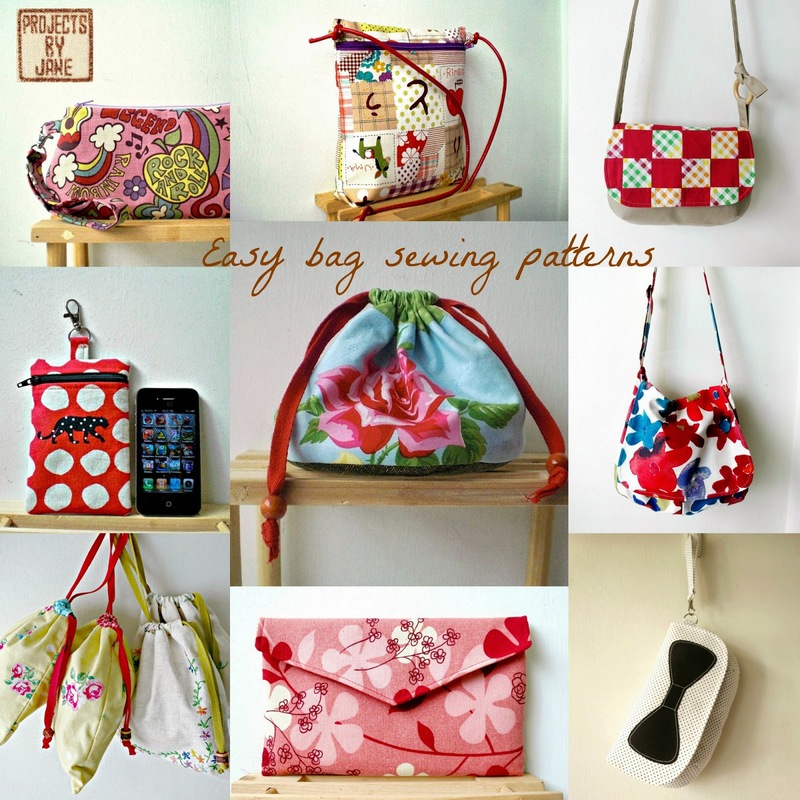 Both winners will also get 1 of my bag patterns and she can choose from my bag pattern empire below. Both brooches took forever to make. 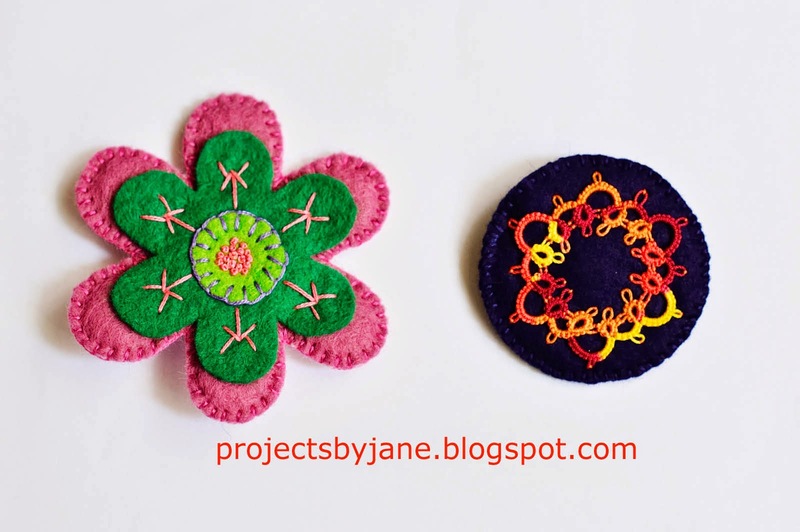 The felt flower is fairly easy to make and this one was made some time ago. The tatted lace is more challenging of course. First I have to make the lace motif which although is a very basic beginner tatted motif, you still need to make it stitch by stitch by hand. Unlike sewing, you can't use a seam ripper and you have to pay attention while tatting. I used a delicious Lizbeth thread. Looking at all the different colours on the lace makes me drool. After the motif is completed, I anchor the lace to a indigo felt by hand, stitch by stitch. ♥ Leave a comment on this blog post. Tell me which package you prefer. 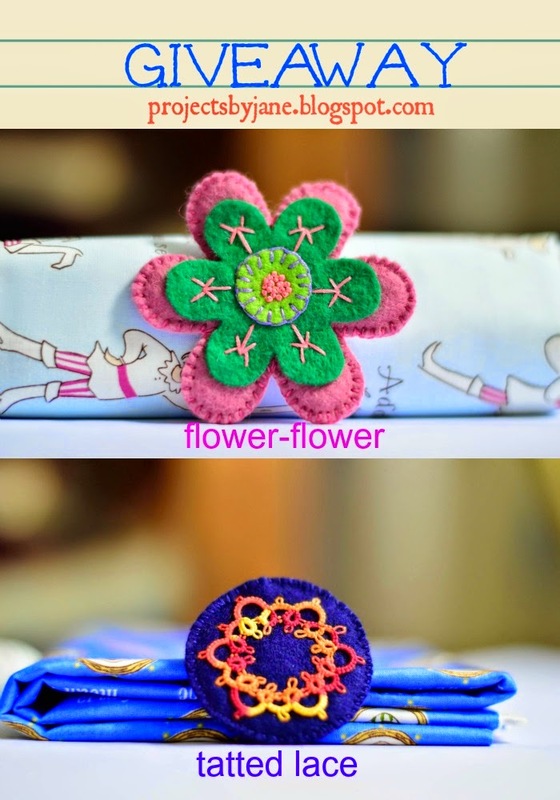 Flower-flower or tatted lace. It's that simple. The first winner picked will get her choice and the second winner picked gets the other prize. ♥ One entry per person, duplicates will be deleted. ♥ Please leave your email address if your profile is not tied to your contact info. If you use Anonymous to leave a comment, you must include your email address. 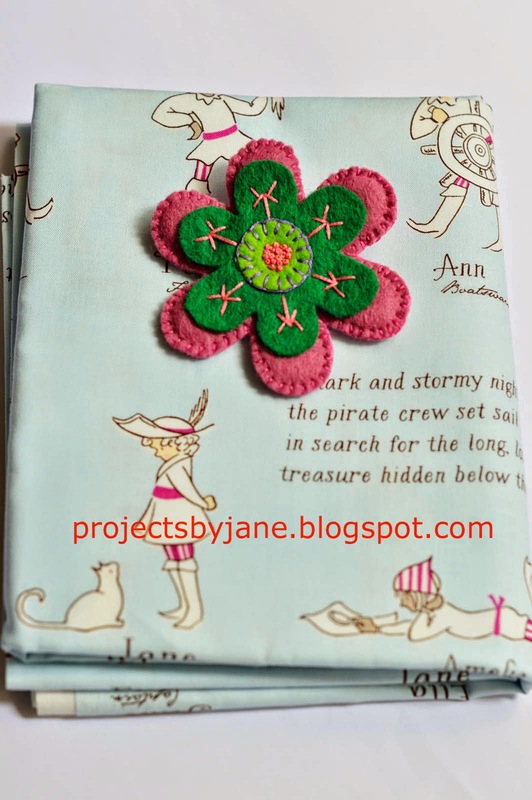 ♥ Open to anyone, anywhere who loves brooches or pirates or the sea. And yes, even if you've won before, you are welcome to enter. Don't be shy. ♥ Ends 8th September 2014, Singapore time. Two winners will be picked by random.org and the winners must respond to my email notification of the win within 48hours or I will pick another winner. On Saturday, hubs had free tickets to S.E.A. Aquarium on Sentosa and of course we had to go. Unfortunately, he only had 2 tickets so my kids had to miss out. Well, they had classes to attend anyway. Sentosa is a resort island very close to Vivocity - the shopping mall where I used to sell my bags? In the past few years, I've only been to Sentosa twice and both times to attend a wedding or a birthday. So I never got to look around the island. I did notice there have been many developments going on for a few years. 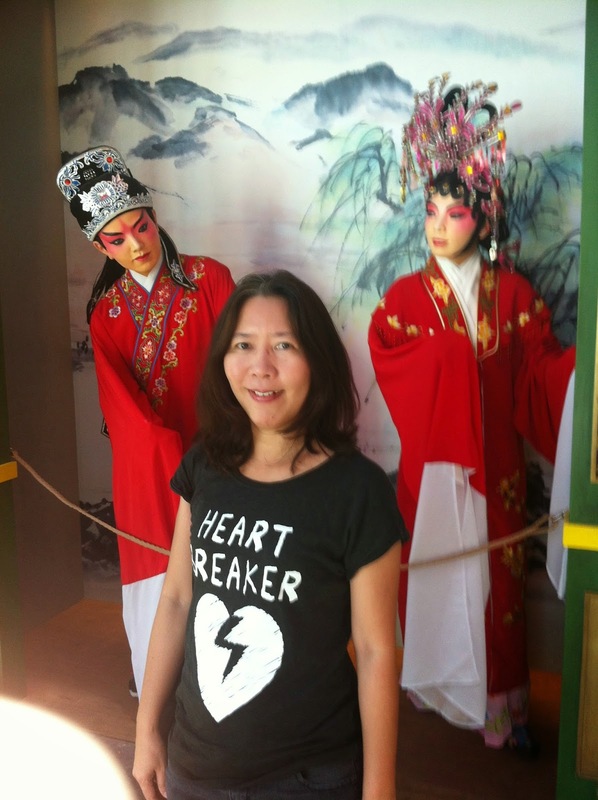 We took a taxi and it took us to Resorts World Sentosa. The taxi driver said if he dropped us off at this location, we need not pay an extra $6. Resorts World Sentosa is mega huge. In fact, you could spend the whole day in this building and never even step foot on Sentosa soil. It houses Universal Studios, Marine Life Park, S.E.A. Aquarium, Adventure Cove Waterpark, Dolphin Island and Trickeye Museum. I had no idea Sentosa has changed so much. In the old days, it was just the cable cars, beach, cycling and a few boring exhibits. I mean, I considered it a hardship going to Sentosa. Guess what? Now this building alone has Hard Rock Cafe, McDonalds, Toast Box, Chillis, bank, cash withdrawal machines, pharmacy and lots and lots of other restaurants. It's just like Singapore! For god's sake, it has Din Tai Fung too with the usual long, long queues. I forgot to mention that one of the main attractions on Sentosa is the 24 hour CASINO. There is a entry levy of $100 per person for Singapore residents, i.e. the citizens and permanent residents. 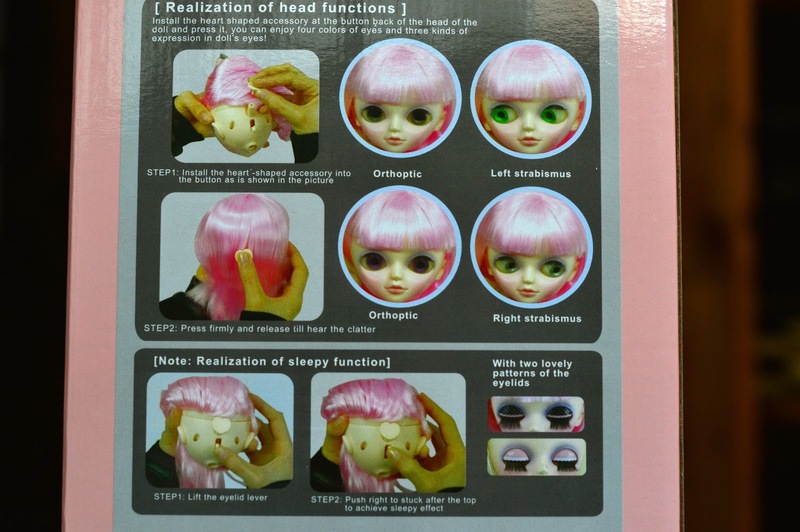 Remember in my previous post about this doll shop that charges a look-see fee of $5 each? That's peanuts. I doubt if hubs will ever pay $100 just to enter the casino. Plenty of locals go to the casino. So $100 is not really a deterrent. The casino offers a $2000 annual levy for the addicts. I have been to a casino before, I think somewhere on the gold coast, Australia? It was a long time ago so I don't remember the name. I was there with my family and we decided to have a look-see. I tried a few things, won some and lost some. In the end, I was even again and decided to quit. The house always wins! It was frightening how fast you can lose your hard earned money! I forgot to mention that hubs was given the free tickets for his company's family day. So there was some attempt to entertain us via game booths. You probably don't recognise me because I wore my glasses. This game is very simple. Throw a bean bag at the cans and knock them down. Know why I was laughing? I completely missed the target. How hard is it to aim? But I got another try and I managed to knock most of the cans off! Won a small useless prize. This game is really simple but I couldn't hit any of the bandits the first time. So I had to queue up again and the next round I got 3 bandits. One more useless prize! This game was my favourite. All you have to do is maneuver the ping pong ball to the end of the maze without letting it drop through the holes. I was steady as a rock. One more useless prize. Even though I had to queue up at each game booth, I really enjoyed myself. Hubs didn't even play a single game. 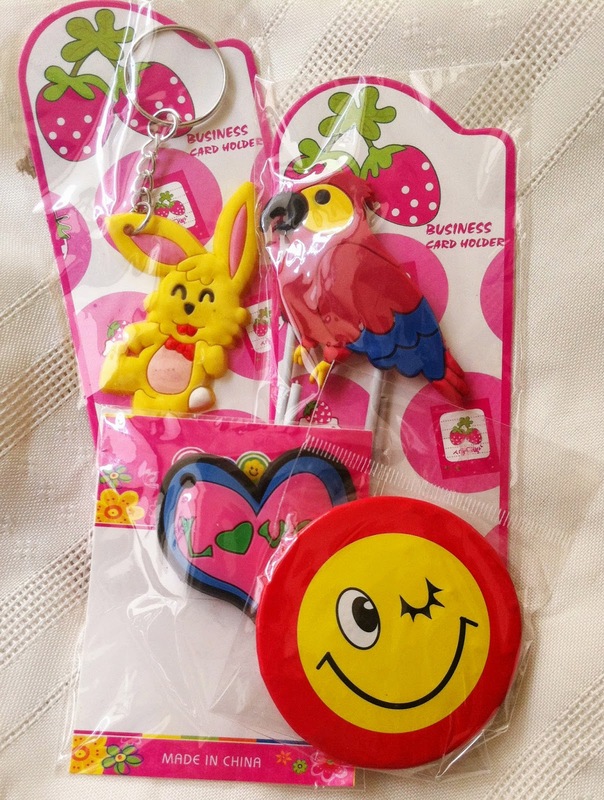 These are the four prizes I won. Now that I'm looking at them closely, they aren't so useless after all. Well, we finally made our way to S.E.A. Aquarium. But we had to "journey" there. Along the way, we saw lots of other exhibits not related to the sea. There was a very long queue leading to the tunnel where the aquarium is, so we just needed to be patient and look at the other exhibits all around us. See this family swaggering past us? Because they paid for the Express pass, they get to bypass the queue. But what they didn't know is once they reach the tunnel, they have to queue and squeeze just like every one else. Heeheeheehee. They must have been so pissed. See? There's no special queue for the express pass holders. I wonder why the designers did not make the tunnel bigger. Inside the tunnel, my phone camera didn't work so well. Very blue. I managed to get a shot of the hammerhead shark as it swam above me. This is a separate shark tunnel. As much as I enjoyed viewing the sea creatures, I felt sorry for their lives as exhibits. No we didn't break any bones. I was quite cool having climbed many fences in my youth. Hubs on the other hand was completely drenched with sweat. Can you see Vivocity behind him? I really want to explore Sentosa again but definitely with the kids and on a weekday. It's August already, can you believe it? My real life is so interesting, it seems, that I forget to drop by here. I'm kidding, I'm kidding. Every day it's the same old "What to eat? ", "What to eat?". The diet I'm on is not too restrictive yet the hunt for food to eat for two meals every day is so exhausting. Occasionally I splurge and pay a little more for something interesting to eat. 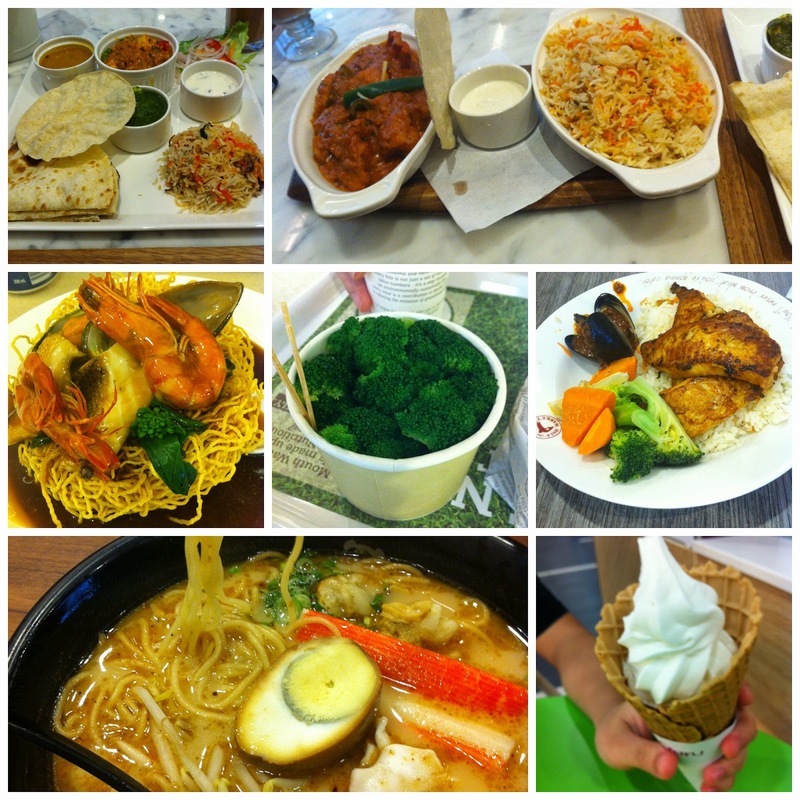 One day I hope to cut out the seafood and just eat fish, vegetables and fruits. With all that splurging, my weight hasn't gone down one bit. I'm running a lot more nowadays. 6km is my maximum at the moment. I hope to increase to 8km one day. Today hubs suggested that I run short distances, say 1km, but at a fast speed on the days I don't run 6km. I'm thinking of trying out his suggestion. Am I mad? Yesterday I had my first Pilates session after a very long break. I got an Activesg account and it is credited with 100 dollars (a present from the government) which I can spend on sports programmes. For my Pilates class, I can pay 30% using the 100 Activesg dollars. The rest I have to pay myself. It's $95 for 12 sessions so I think it's quite cheap. The dance studio where it's held is a little too cramped for comfort. I think if there weren't so many people in the class, it would be more pleasant. On Wednesday, something a bit exciting happened. Hubs and I had gone to check out the location of the dance studio where my Pilates classes would be held and while on the train, hubs checked his facebook and saw a flash sale of some dolls at the shop where he had bought me these dolls and these dolls. The dolls on sale were like missing a shoe, an arm and were priced very low. I swear it's all hubs' doing. He insisted we go to the shop right away. Right away! So spontaneous. I felt like we were dating all over again. I had never been to this particular doll shop before and he wanted me to experience it for myself. So you remember that. It was all hubs. The shop is in the east so we kinda had to take a long train ride. Unlike most shops which try to be as visible as possible, this doll shop hides itself. 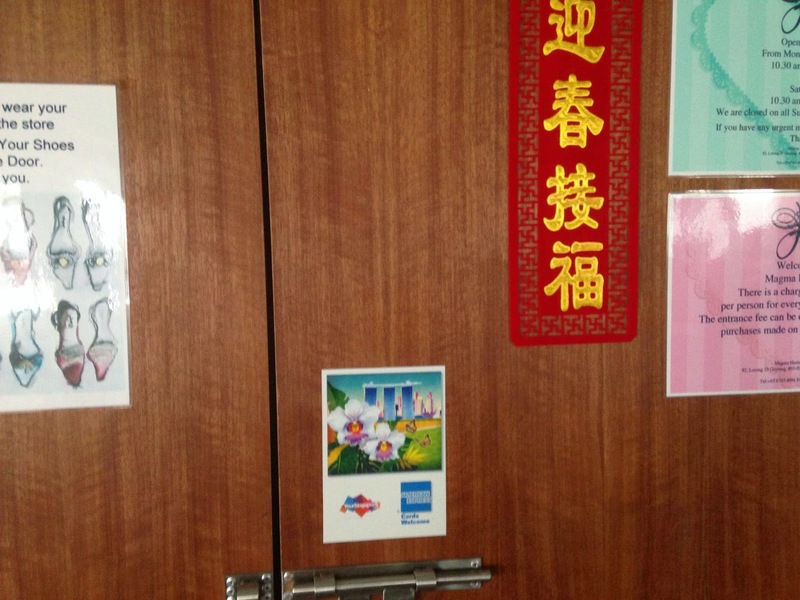 For starters, the entrance to the shop is via the carpark. I almost felt like we were doing something illegal like scoring drugs. To enter the locked shop, you ring the bell and someone would open the door a crack and ask you what the hell you want. Okay, I made that up. The voice would ask you what you want. Hubs managed to squeak out that we were there for the sale. The door opened and we were told that everything on sale had been sold. What? Dolls with missing shoe and foot and whatnot are in high demand? Oh well, we had gone all the way so we might as well look around. We had to remove our slippers and walk barefooted in the shop. The shop is big enough. It even has a higher level but it was out of bounds. 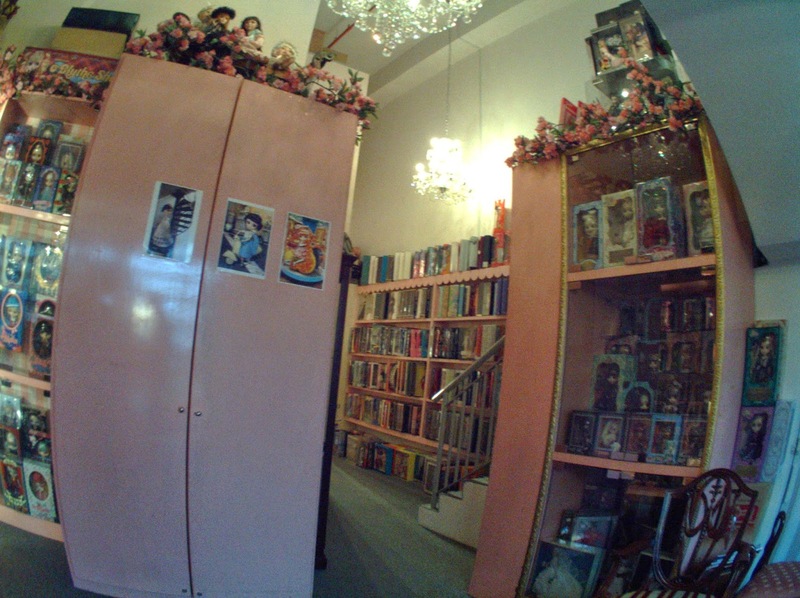 (they probably have all the good stuff upstairs) Every single wall is stacked with dolls. Pullips, Blythes, Barbies and stuff I've never even heard of. 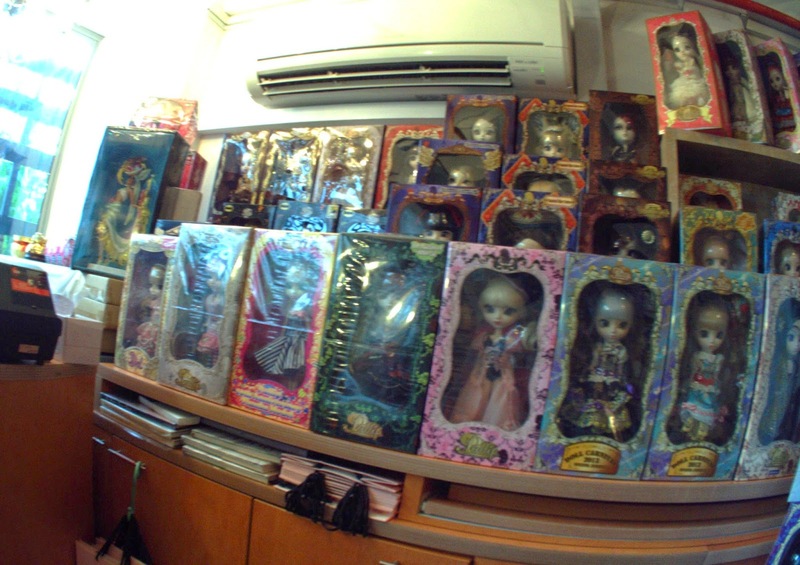 It's a dolls paradise. Oh, I almost forgot to tell you something. The shop is a little bit like Hotel California. Once you enter, you can never leave... Unless you buy something or pay a $5 look-see fee. I know hubs wasn't going to fork over $10 for a look-see so I looked around desperately for something I could buy. At first I was shown all the expensive stuff by a male staff (the owner's son). I declined everything he showed me. Luckily he disappeared upstairs. Finally, I decided it was best to reveal I am a cheapskate to the female owner. She was good natured enough to tell me the price of every single doll I pointed at. 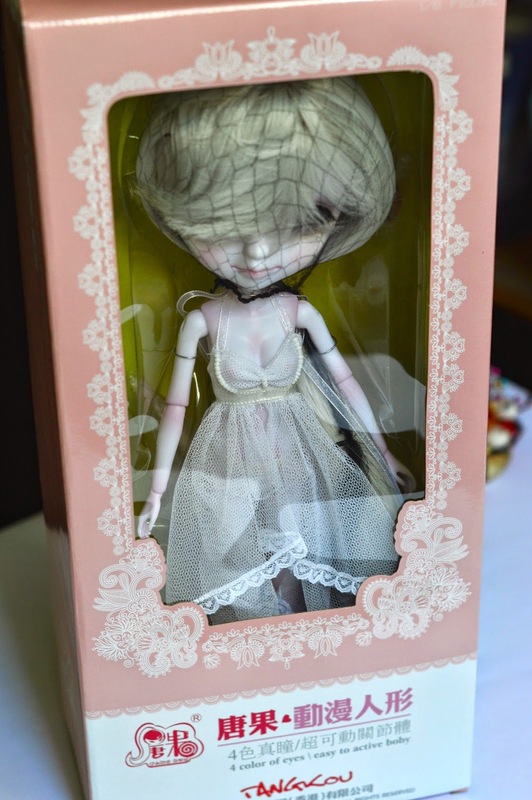 I was torn between a few tiny dolls and hubs was even prepared to splurge on a Blythe. Then a strange looking doll caught my eye but I thought it might be out of my price range... As it turned out, the strange looking doll is made in China so it is in my price range. 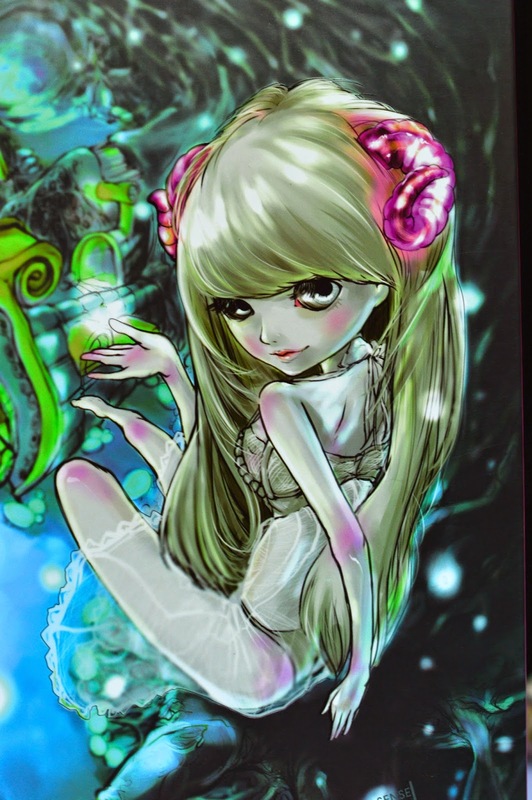 For some reason, this picture is on the box but it looks nothing like the actual doll. This is the actual doll. I don't really like the outfits but that can be changed. I hope this doll won't break easily. Does it look creepy to you? The hair is removable. This tangkou doll has some amazing functions. The English translation is quite funny. And so just like that, I have another doll in my collection.